We are are team of teachers with a combined 27 years of teaching English as a Foreign and Second Language. A large chunk of this experience was spent teaching English to kids. Kisi is the founder and CEO of Eduterials Limited, a company, governed by the laws of Hong Kong. He is the project manager and brain behind the site. His full name is Kisito Futonge, but is fondly called Kisi. He is the guy who starts these types of projects. He is the 'ideas man' who plans and assembles the right talents. Kisi has been teaching English for over 10 years and has successfully created thousands of teaching materials across several sites. 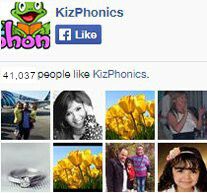 As author of the Kiz Phonics Books and site, Kisi is simply putting his creative genius in your hand. As a child, Kisi remembers very vividly how he learnt to read. At the time, he did not know his teacher was using synthetic phonics. It only made sense when Kisi grew up and became a teacher himself. He started using the technique on his students and was happy to see them achieve the same great results. At school, Kisi was a testing ground for two teaching methods. At school, the whole language approach was not working for both him and his sister who were falling behind in reading and learning as a whole. Kisi's father, being the busy principal of a secondary school, decided the whole language approach used at school was not working. He knew the answer resided in phonics. His father took Kisi and his sister Isabel to meet Mr. Jacob, a primary school teacher who specialized in using synthetic phonics to help children read. It only took one summer holiday, with the right teacher for Kisi and his sister to crack the reading code. Both Kisi and Isabel went from reading all public signs they saw, to reading complete literary volumes. They both went from under-performing students to top-of-the-class A-graders. What did you expect? The lack of reading skills had been a serious handicap to learning Math, History, Geography, Literature and all the other subjects that were taught at school. Nani D. Wall is the academic director. Everything that gets created has to pass through her screening. She is absolutely ruthless when it comes to spotting mistakes. Nani taught in the US for 14 years before moving to China to work as Academic Director of 4 Kindergarten Schools in Shenzhen. She has been working in Shenzhen for 3 years and therefore brings a cumulative 17 year teaching experience to Kizphonics.com. Jude M.: Jude is the author of math4children.com and has been watching this project closely. He is no stranger to homeschooling kids through phonics. He provided valuable advice during content creation. Alexandra F.: Baby A as we call her, is the inspiration behind the site. Before Kisi's daughter Alexandra was born, he had been thinking of developing an early reading program which will definitely help her to crack the reading code as early as 3 years of age. Benjamin L.: Ben is the thorough Swiss graphic designer from Intus creative studio, who helped to illustrate the stories, design the book layout and worksheets. This explains why our worksheets are of such high quality. We start by designing our worksheets as we normally do. Then Ben takes them and spins them around in his graphics design lab to come up with these professional looking crafts. Woad: Known as the programming guru, Woad will program just about any learning idea you have. He is the programmer of some of the interactive games you find on this. He also knows how to cut us a deal at the print factory. Sandeep Nehra: A site like ours requires a dedicated web development team. Heading that team is Sandeep, who deals with web development and programming issues. His sophisticated abilities in this domain have been significant in creating a smooth experience for our visitors. He is responsible for the technical aspects involved with running this site.